Home > Don’t Wait to Buy! Don’t Wait to Buy! Now that the housing market has stabilized, more and more homeowners are considering moving up to the home they have always dreamed of. In most areas, including Tahoe, prices are still below those of the peak in 2005-2006. Also, interest rates are still near 4%. However, sellers should realize that waiting to make the move while mortgage rates are increasing probably doesn’t make sense. 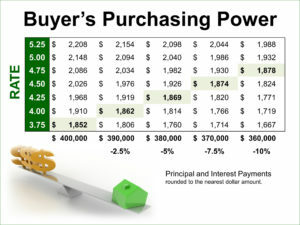 As rates increase, the price of the house you can buy will decrease. As the chart shows, a single point increase in interest rates can reduce the purchase price of the home you can afford by 10%.